Most of us like to shower or bathe every day, but that can be a real pain if we have sensitive skin. Many popular soaps smell great but they cause dryness or rashes. It’s frustrating trying to find a bath gel that gets skin clean without causing a bad reaction. We’re going to help today by reviewing the best body washes for sensitive skin. Before we begin, here is a quick overview of what to avoid and what to look for in a gentle soap. What’s on a label, and what does it mean for sensitive skin? It’s tempting to buy a new body wash based on its delicious scent, but that’s exactly what people with sensitive skin can’t do. Avoid synthetic fragrances because those are one of the top irritants and allergens for skin. "Unscented" is not the same as “fragrance-free.” Unscented may simply mean it doesn’t have a strong odor, but that’s because another ingredient is masking the smell. Free of fragrances altogether is much better and safer. We included some “unscented” products because lots of people with sensitive skin have said they’ve had success using them, but that doesn’t mean every one of them will be safe for you. "Hypoallergenic" is another one of those terms that doesn’t mean what you think it should. There is no FDA standard that defines what is required for a cosmetic or skin care product to be hypoallergenic. Companies can label a product with this term although it contains exactly the same formula as another one. The only difference is packaging for the targeted demographic. While companies may say their “hypoallergenic” product was tested to show it caused fewer adverse reactions, that means they did their own testing and it wasn’t regulated by any outside agency. The only way to protect yourself is to read ingredient labels. You’ve seen the bad, now let’s look at the good. If you want to soothe and moisturize sensitive skin, these ingredients can help. And wash with lukewarm water instead of cold or hot. Now that you’ve seen the bad and the good, let’s begin the reviews of the best body washes and shower gels for sensitive skin. 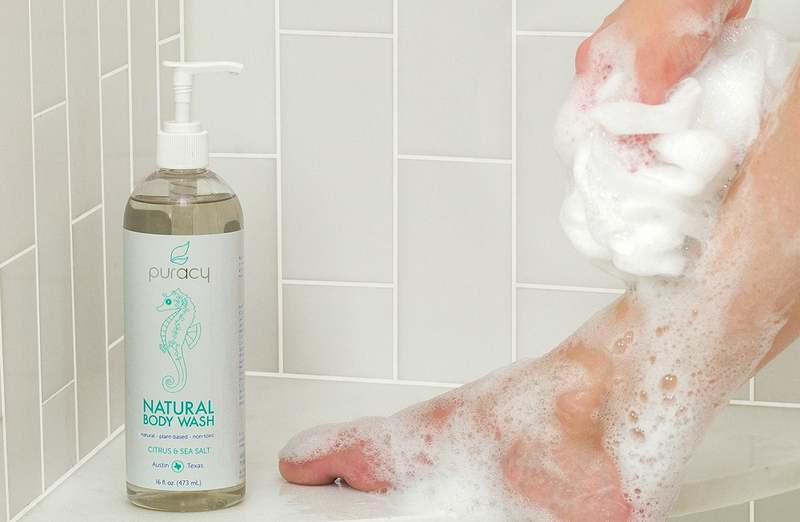 Puracy’s Natural Body Wash cleans and softens skin with the power of coconut, Himalayan Pink Salt, and pink grapefruit essential oil plus vegetable glycerin. The coconut-based surfactant makes for a nice lather without the risk of irritated or dry skin. The Himalayan Pink Salt exfoliates dead cells and helps hydrate skin. The glycerin is a natural humectant that draws in moisture. There is no residue left after rinsing, just soft skin. Puracy points out that their formula was designed by doctors to be safe on any skin type, on men or women. It doesn’t contain the usual irritants like sulfates, parabens, petroleum derivatives, dyes, caustics, formaldehyde, MEA, DEA, TEA, triclosan, animal by-products, phosphates, or artificial perfumes. The citrus and sea salt scent comes from natural ingredients, not synthetic chemicals. The manufacturer offers a 100% satisfaction guarantee—if you don’t love it, you’ll get a refund. The price makes this a good deal for the value it offers. Users are overwhelmingly positive in their reviews online, maintaining this body wash as a best-selling product. We chose this as our top pick to care for sensitive skin. Kiss My Face’s Fragrance-Free Shower Gel doesn’t contain gluten, parabens, phthalates, or artificial fragrances. Users enjoy that it’s gentle to the skin, leaving it soft and clean. They say it smells a little like pine, but the scent fades. The formula has olive oil and aloe vera as well as Vitamin E to heal and soothe skin. The rest of the ingredients are not rated as hazardous by the EWG with the exception of Potassium Sorbate and Phenoxyethanol, rated 3 and 4, moderate hazards. Overall, this seems to be a rather safe product to choose if you’re looking for something that’s unlikely to irritate or dry out skin. EWG rates Dr. Bronner’s Pure Castile Lavender Liquid Soap as a 1 overall, the lowest hazard rating they have. The ingredients, besides soothing lavender, are hemp seed oil, glycerin, coconut oil, citric acid, olive oil, Vitamin E, and water. It’s a very simple product. There are none of the usual allergens or hazards. Some users love Dr. Bronner’s soaps and use them for everything, from body wash to doing the wash. One caution: it’s best to use this formula diluted at first to see how you react. Many users place half a teaspoon size portion, full strength, on a loofah or washcloth and use it like that. Bathing shouldn’t require stripping away your natural oils or irritating your skin. We’ll begin with a selection of popular washes you’ve probably seen on the shelves at your local supermarket. Dove’s Sensitive Skin Body Wash is an example of the formulas that use the term hypoallergenic, but include ingredients that may irritate skin for some users. While many people have given unsolicited positive feedback on this product, saying that it leaves their skin feeling nice, we want to point out that it contains fragrance, sodium laureth sulfate, and methylisothiazolinone. Aveeno’s Skin Relief Body Wash is made to soothe dry, itchy skin even after it’s rinsed away. Aveeno says it’s free of soap, dyes, and fragrances. It’s based on oatmeal, which actually can help skin heal. Once again, this is a popular product that has many positive reviews online. Some people swear that it’s saved their skin. Those users are apparently not affected by the sodium laureth sulfate or the propylene glycol in the ingredients. Olay’s Sensitive Unscented Body Wash is said to moisturize skin and stop itchiness, and it’s quite popular. Unfortunately, the list of ingredients shows a few things that may irritate skin, like petrolatum, sodium lauryl sulfate, methylchloroisothiazolinone, and methylisothiazolinone. Those last two components are banned in leave-on skin products sold in the EU. Also the “unscented” is not a guarantee that there is no fragrance, just that you won’t smell it because it may be masking the scent of other ingredients. Nivea’s Crème Sensitive Wash contains chamomile, a natural ingredient that calms irritated skin. The formula doesn’t contain soaps or dyes and is made to moisturize dry skin even after it’s rinsed away. And yes, the label lists some disappointing ingredients like sodium lauryl sulfate and a fragrance. The men’s formula from Nivea lists even more natural ingredients than the one we just reviewed above. It contains Bambusa Vulgaris Leaf to provide silica for building more collagen and elastin, plus almond oil and sunflower seed oil to moisturize. Of course, it also has sodium laureth sulfate and a fragrance. Eucerin is a company that makes a lot of products for users with sensitive skin. They point out that they are often recommended by dermatologists. So let’s take apart their claims for their Skin Calming Body Wash.
For one, it is oil-free and fragrance-free, not just unscented. Two, it says it uses omega oils and lipids to moisturize skin. Those appear to come from castor seed oil and soybean oil. That’s good news so far. But if you look on the EWG database, you’ll see that this wash was rated a 4 for “moderate hazard.” Why? Primarily because it contains BHT and Cocamide DEA as well as a few of the “-eth” ingredients. Those first two things are linked to allergic reactions. Cetaphil’s Gentle Skin Cleanser is made for all skin types and people of all ages. It’s hypo-allergenic, non-comedogenic, and has no scent. Users with psoriasis, rosacea, and eczema have commented that it moisturizes and cleans well, without stripping off all the skin’s natural oil. It sounds great, until you see that the ingredients list contains all three parabens as preservatives: polyparaben, butylparaben, and methylparaben. Scientists operating independently have linked these three to skin irritation and endocrine system disruption. Since you’ll be rinsing them off, it may not be as great a problem. Sebamed’s Face and Body Wash for Sensitive Skin is pH-balanced at 5.6 so it’s not as harsh on skin as some soaps. Some users love it. But be aware that sodium laureth sulfate is one of the first ingredients on the label, as well as other “-eth” components, plus a fragrance and dyes. Phisoderm’s soap, dye, alcohol, and fragrance-free formula is pH-balanced to protect skin. Unfortunately, the ingredients label lists mineral oil that can clog pores, plus sodium laureth sulfate, methylparaben, propylene glycol, and propylparaben that can irritate skin. Curel’s Itch Defense Body Wash says it stops skin from being itchy after only 4 days of use. It has no added fragrance. Unfortunately, the most useful ingredients like jojoba and olive oil are the last ones on the label, while Sodium Laureth Sulfate is one of the first, and Cocamide MEA and parabens not far behind. The Body Shop’s Almond Milk and Honey wash is made to sooth dry, itchy skin. It contains almond milk from Spain and community trade honey from Ethiopia, which sounds delicious and inviting. Until you see that the label reveals sodium laureth sulfate, a “parfum” or artificial fragrance, phenoxyethanol, and laureth-4. If none of those are of concern to you, you may enjoy this body wash.
Mustela’s Gentle Cleansing formula is free of parabens, phthalates, and phenoxyethanol to keep it from irritating skin. They say ninety percent of the ingredients are derived from plants, plus it’s enriched with Vitamin B5 to nourish skin. It does have a fragrance listed on the label, plus some suspected irritants like sodium myreth sulfate. A similar product from the same company achieved a low to moderate hazard rating on the EWG site. AHAVA, an Israeli company with products sold around the world, bases their Mineral Shower Gel formula on mineral spring water and “maris sal,” rich mineral water from the Dead Sea. It also contains aloe. Users say it leaves their skin soft and moisturized. It does contain a perfume, or fragrance, that smells like cherry and pomegranate, which could be an irritant to very sensitive skin. There are a handful of other components that are rated as potential allergens (at 4 or less on EWG’s database) like Cocamidopropyl Betaine, Phenoxyethanol, and Potassium Sorbate. Some of us just prefer bar soap over liquid. The Dead Sea mud bar from AHAVA is rich in minerals and good at removing dirt from skin. Users say that it clears up body acne and leaves their skin soft, but not dried-out or stiff. We hope we helped you select the best body wash for your skin today. Come visit us again soon to see new reviews of the best in beauty and skin care products.